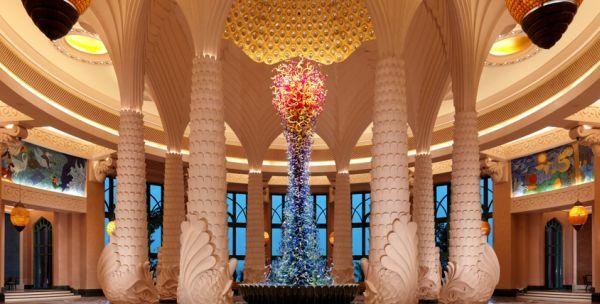 After UK and China, India has been a top priority market for Atlantis The Palm and the recent addition of the wedding lounge for Indian couples shows the further commitment of the brand towards the Indian market. He further mentioned how the focus is on to increase the stay of visitors more than the preferred weekend getaways. “To make their stay more enjoyable, we have the waterpark, marine attractions as well as two swimming pools where families can bask under the sun as well as the kids can have a memorable time,” he added. Indian cuisine is always a must asked question by Indian travellers and Atlantis The Palm gives them no reason to complain. There are Indian chefs who prepare Jain food and customise dishes according to the guests’ liking. Even Indian nights are held at the hotel which celebrate Indian culture and cuisine making the guests feel at home. Apart from this, even other cultures are celebrated here as the hotel is home to nationalities from all over the world. For Indian couples looking for a more intimate setting for smaller functions such as mehndi and haldi one can choose from a variety of smaller venues, both indoor and outdoor, including the elegant Silk and Spice Ballroom, which seats up to 250 and the Palm Grove for 100 guests in addition to the Zero Entry Pool-side and the Nasimi Beach. Express Food & Hospitality is the most reliable source of information for the Indian hospitality industry. It is published by Global Fairs & Media Pvt. Ltd., a wholly owned subsidiary of The Indian Express Group. From news and analysis to latest policy updates, articles on F&B, tech talk by experts to manpower management issues – Express Food & Hospitality is India’s most comprehensive publication for the hospitality sector and has a wide readership across the country. @2018 - The Indian Express Pvt. Ltd. All Right Reserved.